San Diego Unified Superintendent Cindy Marten told her Senior Staff, including Chief of Staff Staci Monreal, to “Read” District Deeds!!! 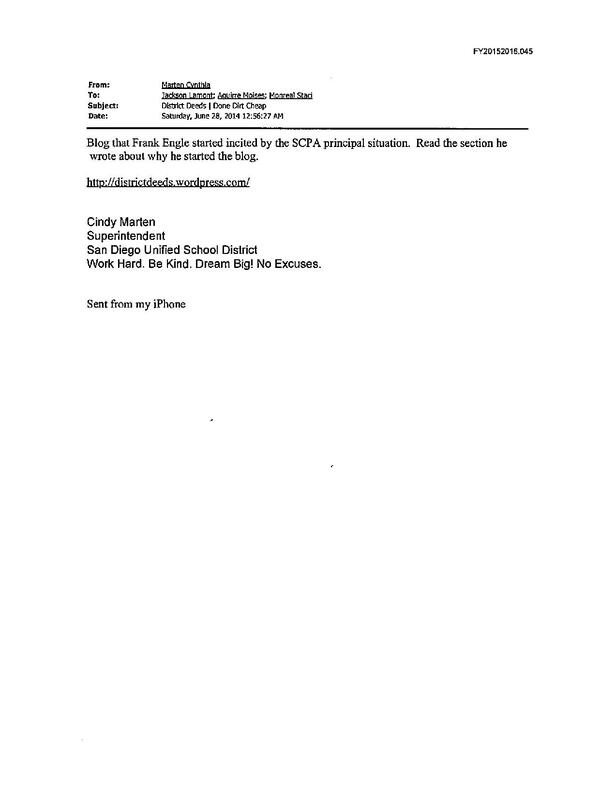 This email was from a Freedom of Information Act (FOIA) by the Voice of San Diego that District Deeds acquired through public records. Thank you Voice of San Diego! Thank You for your endorsement Cindy Marten!!! Now ALL of your 13,000 employees will no longer be fearful that accessing District Deeds at work could result in any disciplinary action. If MARTEN encourages her Senior Staff to read District Deeds during business hours, it MUST be OK for Principals, Teachers, Site and District Staff and all rank and file employees to read it WITHOUT RISK! DISTRICT DEEDS GIVES A HEARTY WELCOME TO ALL SDUSD EMPLOYEES! District Deeds appreciates this recommendation by Cindy Marten SO MUCH that we will be posting it both as a permanent page titled “Cindy Marten Says “Read” District Deeds” and use the picture above as our Blog Banner for a period of time. You are intelligent Frank great way to inspire employees to become true stakeholders in their school community by expanding their knowledge of all sides of issues tather than just what they promote inside, as well as, provide legal premise and protections for staff who truly look out the box in finding solutions as to WHY certain aspects of what they may have been implementing in vain is bot working inspite their best intentions and elbow grease, why they are hearing conflicting information as opposed to what they read and know the laws to be, and b perhaps and answer to why they suddenly find themselves on a Paid Adminitrative Leave for meritless accusations for simply daring to ask or present the REAL Intent of what the law says as they know it to be to the wrong Administrator (strike that) the many Administrators, who are also afraid that your concerns are going to shine a big light on their inability to keep the school site staffs’ opinions to themselves and definitely the even worse situation is keeping those nosey staff members from sharing their pearls of wisdom to the Parents and Community members, who may follow through and report to the QA department (where we are dutiful staff are supposed to send parents with questions like these)…..QA will definitely narc this fearful principal/administrator out and well…we know what happens next to those who ventured to think outside the box, express it in true collaboration, and in the interest of making their schools the places they are meant to become! So, Who will sign as field representarive? Or is that even. a necessary part of the process? Every interaction Ive had thus far has been one of either trying to convince them that a grievance is in order and PLEASE file it before the time statute runs out…OR, the other type smonkey bisiness which is the distticts uttet disregard of the collective bargaining contract and skipping steps taking matters tk the level under which, according to the rep, they dont have bargaining rights for any actions beyond that of an suspension? Anything in between (is their aread of intervention (i.e. warnings, lstters of reprimands, suspensi OK ns, expedited evals). And I wont get started on the whole “gate keeping” situation regarding gettimg access to legal support… And tbe strange part is, .as members of the union, our fees pay towards our being able to acces our GLS Plan (group legal services..kind of like the HMO of legal providers) and yes that is an request to access. But what about the additional ELL (Educators Liabilily Legal Poliy) tthru CTA and NEA ww alsi have access to as part of our being a member of union? Cause let me te you..or please someone tell me how does one access THAT plan?! Is there a girvance form for greiving our union for not providing us with the protectiions and difection on zu h.mztwe have been told we have?